The problem with pivot points – events that result in major changes in your organization’s history or your personal career – is that they often slip by unnoticed. The significance of the event isn’t recognized until later. You typically have to dig deep into the past to identify your pivots, the lessons they taught, and the opportunities they created. 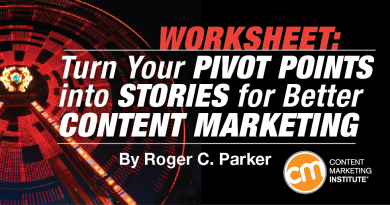 The reward for digging deep, however, is that past pivot points often uncover story opportunities that can help you define your brand and create memorable story-based content marketing. In addition, by identifying the key turning points, you are better able to recognize potential pivot points as they occur. Even better, you become better equipped to create opportunities for future pivot points for yourself and your organization. I’m a big fan of Todd Wheatland’s podcast, The Pivot: Marketing Backstories, which are weekly 20-minute interviews with marketing leaders who reveal their humanity and share the events that contributed to their present successes (and they always include a pivot point). Reactive or compelled by circumstances. In many cases, pivots were caused by external forces such as the sudden loss of a job. Proactive or rolling the dice. As Mark Schaefer discussed, these pivots happen when the individuals saw greater challenge and opportunity elsewhere; they made the decision to make change happen. Listening to Todd’s interviews inspired me to take a fresh look at the turning points in my own past that contribute to my brand story. I was surprised by own timeline. The more I explored the obvious turning points in my career, the more I discovered other, previously unacknowledged turning points. And, the more I analyzed my turning points, the more lessons I learned from each. The same can work for you, your department, and your organization. 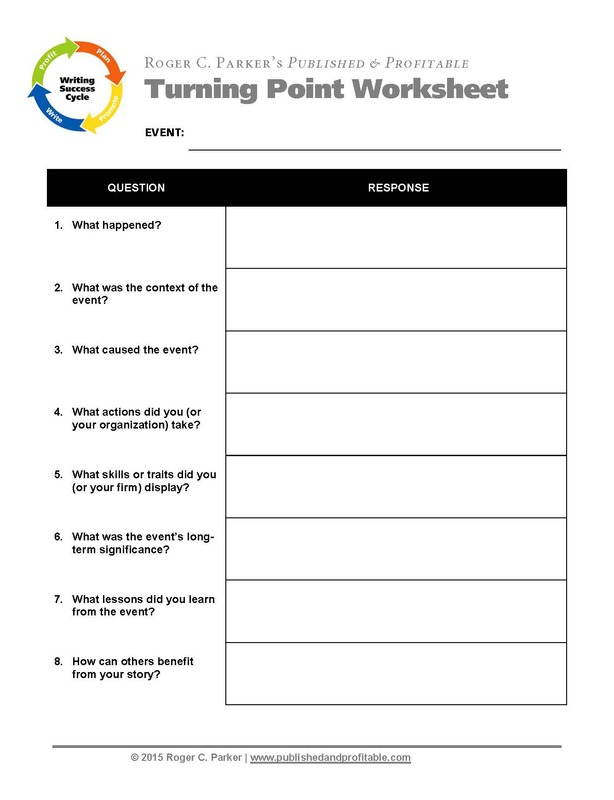 To help you learn from the turning points in your or your organization’s background, I created a simple worksheet to help you locate the relevant turning points as well as uncover the details surrounding each story. You can download it here. Identify. This involves looking for patterns between the turning points in your career or your firm’s history. At first, you may only find a few key turning points. But, looking deeper, you’ll probably find that there were earlier actions and decisions that paved the way for your initial choices. Analyze. This involves going deeper, reviewing the details of the context, setting, and actions that preceded and followed. It may help if you imagine “what-if” scenarios, i.e., think about what might have happened if you or your firm had responded differently. Share. The last step is to extrapolate the key lessons from each turning point and help others apply them to today’s business or personal challenges. Content marketing success helps your market profit from your experiences applied to their challenges and goals. What happened? Describe the events leading up to the turning point and the actions that resulted in positive (or negative) change. You don’t need a detailed narrative. A simple list of the key points is enough. What was the context of the event? The turning point’s calendar year is not as important as its point in your career or your organization’s history. Did your personal pivot take place at college, after college, during your first job, or after you were married and thought you had your future all planned? In the case of businesses, was your firm in start-up mode, growth mode, or a more mature phase? The context also includes your firm’s competition and other external factors like changes in technology and the economy. What caused the event? Was there a long buildup to the event – like a simmering desire for change – or was there a single, precipitating act – like a buyout, merger, postponed raise, or personality conflict? What actions did you (or your firm) take? What kind of timetable was involved? Did you take immediate action, i.e., quit on the spot or take a long-range view and started saving money to finance your start-up? What kind of actions did you take? Did they involve performance tasks – like analyzing, creating, improving, planning, producing, or persuading? Did your action involve a series of steps or actions? What skills or traits did you (or your firm) display? In some cases, the actions taken are not as important as the story that the actions tell about you or your firm. Can you describe the steps taken in terms of attitudes, like commitment, perseverance, honor, patience, or risk? Often, what the actions tell about the individual or firm have greater content and story value than the specific steps themselves. What lessons did you learn from the event? As you explore the turning points, it’s important to remember to analyze the negatives as well as the positives. Not all turning points create positive outcomes. Sometimes you make a mistake or overlook an opportunity. In addition to mining the past for lessons taught by positive experiences, it’s equally important to explore negative actions and outcomes. Indeed, sharing lessons from your failures can enhance the image of your brand by revealing your firm’s commitment to transparency. How can others benefit from your story? Look beyond the specifics of your turning point. Look for evergreen – or timeless – lessons that can help your prospects and clients address their current challenges and opportunities. Just as the tools of marketing are constantly changing, but the principles remain the same, every turning point represents a content – or teaching – point for you. Imagine the content you could create if you identified and analyzed just one significant turning point a week for the next few months. Your turning points, themselves, could turn into future turning points! Do you know your organization’s pivot points? Does listening to The Pivot inspire you to take a fresh look at the pivots in your past, so you can either create new story-based content or new turning points in your future? Share your experiences so we can all become more efficient at turning our experiences into content. Want to access more practical insight and tools to better your firm’s content marketing or your own career? Check out a full list of The Pivot archives on the main The Pivot: Marketing Backstories page.